We are pleased to announce our latest release v5.2. It contains several new reports, our new Quick Reports feature and many new import options. 1. 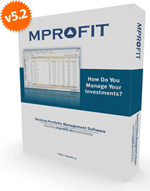 Trading Profit/Loss Reports – Trading summary and detailed reports useful for investors who track their profit/loss on their trading activities in stocks based on average purchase price. The calculations would be different than those generated by capital gain reports which are based on First In First Out (FIFO) basis. 2. Income Reports – Reports give a summary or detailed view of income generated from your assets. For stocks, it would include dividend payout. For mutual funds, it would include dividend pay out and dividend reinvestment. For property it would include rent received. The report also includes all the interest income from your fixed income investment such as Bank FDs, Bonds, PPFs, Post Office, etc. 3. Quick Reports view – From the main summary screen the new “Quick Reports” button provides quick access to 3 reports: Portfolio summary, Trading P/L summary and Income summary. If you would like to see the import feature, below is a YouTube video showing v5.2 in action. From the main menu select Help -> Check for Updates. You will need to restart MProfit to proceed with the update. Please make sure that you have internet connectivity during this process and that your anti-virus software and/or firewall is not blocking the download.